Lawn aerators have improved over the years of their existence. From the crude and primitive types to the high end types that are being used today, lawn aerators have definitely gone through a huge transformation. But why do we need lawn aerators in the first place? Well, for the greener and healthier lawn lovers, aeration is one of the essential factors that helps keeping the soil healthy to allow water to reach the roots. Lawn aerators were designed specifically so it removes soil in the yard and throughout the lawn to reduce soil compaction that aids water in reaching the roots. Going back to the primitive and crude types of lawn aerators, rake-like and fork-like tools were the tricks of the trade to poke holes in the lawn. These are manual tools that were used to punch holes in the ground to break up soil compaction. Half inch diameter holes were punched through the ground, and by using these tools at an angle, aeration becomes more efficient as the holes are punched deeper, thus reaching the roots. Manual push mowers used as lawn aerators require more muscle power to attain the desired aeration efficiency from the holes. These contraptions are quite heavy and can sometimes require double duty especially if it is compact soil. Push mowers are one of the old school power tools of their time; quite useful but not beneficial to both man and lawn. Modern-day lawn aerators have evolved throughout the years. The need for an efficient and effective aeration without sacrificing time and a whole lot of effort has made it possible for manufacturers to develop this efficient power equipment. Core aerators look much like a common snow blower with back-side transport wheels and a motor on the top. It is gasoline-powered and when in use, it removes soil through the push spikes, leaving holes throughout the soil. These holes are quite essential for the grass roots as they allow air, water and nutrients to flow through the soil. When used on lightly-compacted or sandy soil, it only takes one pass with a hollow tine aerator to effectively aerate your lawn. 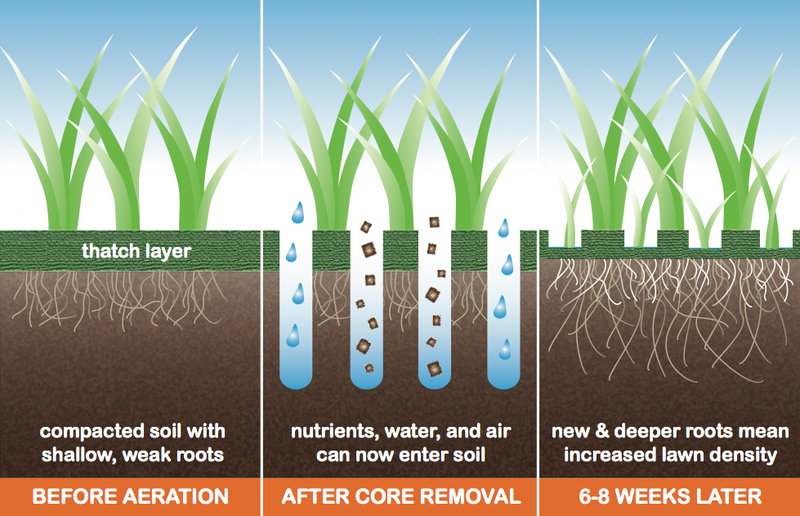 But for clay, untreated, and compact soil, it takes a second pass at an angle to fully benefit from aeration. You may or may not remove the plugs from the ground. It actually depends on you since these soil plugs don’t pose a threat to the newly aerated soil, and won’t prevent you from having a healthy lawn. Some folks prefer to rake off these soil plugs, but eventually these will dissolve when the lawn has been watered. Lawn aerators may have changed over time. But no matter what tools you use to aerate your lawn, it is important to do the chore to let your lawn breathe and to keep the soil and grass healthy.